Stress is an inevitable aspect of life. All living things experience some form of stress during parts of their lives. This course will help you understand stress and learn how to manage and reduce stress by increasing awareness in your body, mind, and environment. In this class, you will learn how to become mindful—aware of the present moment—in order to reduce your stress. You will learn mindful breathing, body awareness, mindful eating, and healthy ways of relating to others mindfully. 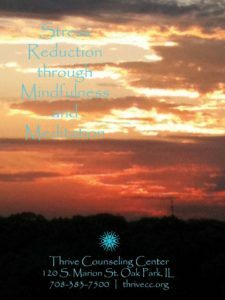 Meditation techniques will be taught using guided and unguided practices. You will have the chance to practice techniques learned at home using the audio CD included with the class fee. The fee for the course is $200. Other stress reduction courses of this kind can be much more expensive, so this is an affordable opportunity to begin taking care of yourself through stress reduction and mindful awareness. Please check the program calendar for the next available course. To register or request further information about this course, please contact Angela Potaczek at 708-383-7500 extension 115 or email at apotaczek@thrivecc.org. You will be asked several questions to ensure that this course is right for you at this time in your life.